Prachuap Khiri Khan (Thai: ประจวบคีรีขันธ์, [prā.t͡ɕùa̯p.kʰīː.rīː.kʰǎn]) is one of the western provinces (changwat) of Thailand. It is in the northern part of the Malay Peninsula, some 240 km (150 mi) south of Bangkok. Neighboring provinces are Phetchaburi to the north and Chumphon to the south. To the west it borders Tanintharyi Region of Myanmar. 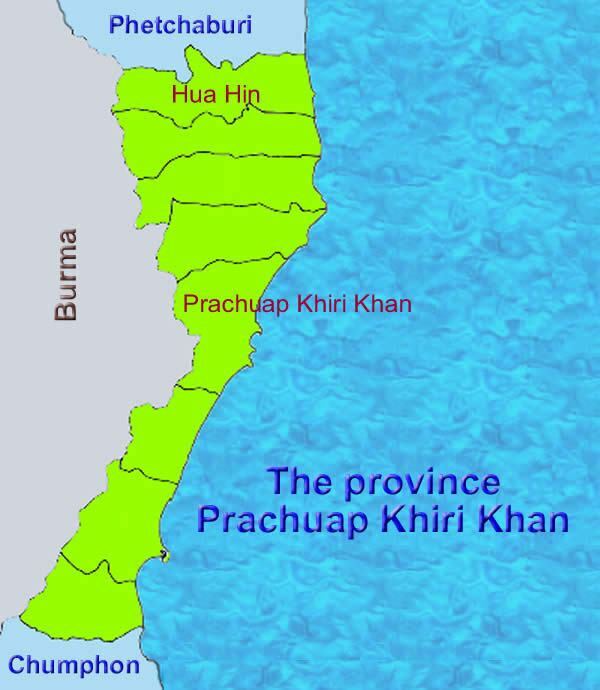 Prachuap Khiri Khan covers an area of 6,367.62 square kilometres (2,458.55 sq mi). The province is on the Kra Isthmus, the narrow land bridge connecting the Malay Peninsula with mainland Asia. The province contains the narrowest part of Thailand. At its narrowest, it is just 13 km (8.1 mi) from the coast of the Gulf of Thailand to the border with Myanmar in the Tenasserim Hills. Geographically, Prachuap Khiri Khan is a moderate plain with elevations varying from sea level to 1,200 m (3,900 ft). The maximum elevations are found in the northeastern and central west regions, which make up approximately 30 percent of the province. 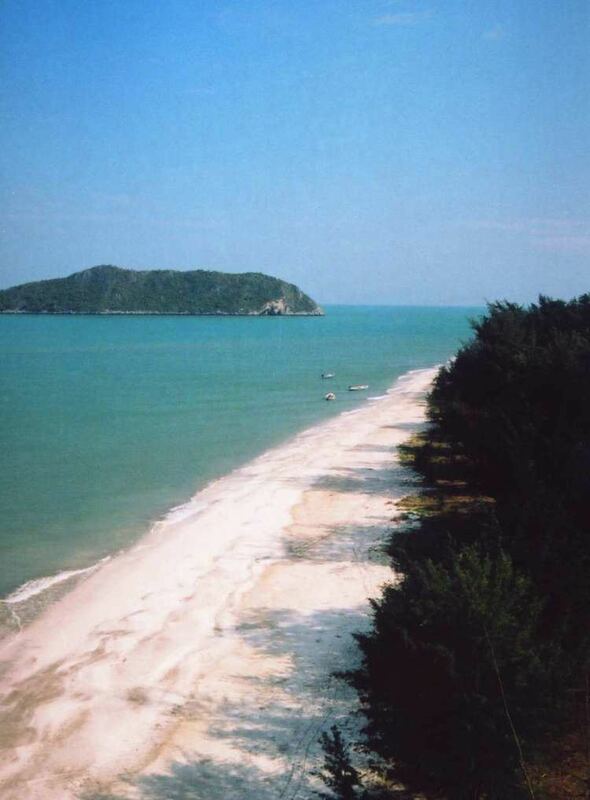 The long coast of the Gulf of Thailand has many sandy beaches. 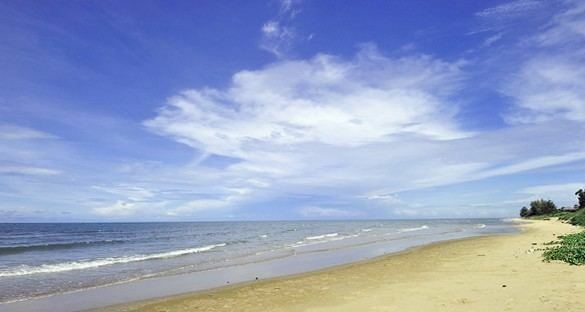 One of the best known, Hua Hin, has been a popular resort since King Prajadhipok (Rama VII) built a summer palace there. From the coast the land quickly rises into the Tenasserim Hills, the mountain chain that forms the border with Myanmar. Due to its narrow watershed, the rivers in the province are all small. The only one of significance is the Pranburi River in the north. Among the smaller rivers is the Khlong Kui. Khao Sam Roi Yot National Park was established in 1966 to protect Thailand's largest freshwater marshes. The park contains some mangrove forests and mudflats. Most of the marshes were converted into shrimp farms, despite being in a national park. The city of Muang Na Rang was reconstructed in 1845, after it had been abandoned during the fall of the Ayutthaya Kingdom in 1767. The town was rebuilt at the mouth of the Ron River and renamed "Prachuap Khiri Khan", which means "city in the mountains". King Mongkut gathered the people of three towns—Bang Nangrom, Kui Buri and Khlong Wan—and resettled them in the rebuilt city. At the same time, he renamed Koh Kong, a city on the opposite side of Gulf of Thailand, Prachanta Khiri Khet. Koh Kong is a now a province of Cambodia. In 1868, King Mongkut invited foreign guests to the province to watch a solar eclipse he had predicted for 18 August. The dignitaries viewed it from an observation point in the marshes near Sam Roi Yot. He contracted malaria, of which he died on 1 October. Prachuap became a seaside resort during the reign of King Rama V. In the reign of King Rama II, a new city was established at the mouth of the I Rom Canal known as Muang Bang Nang Rom. At the beginning of World War II, Japanese troops invaded Thailand. On 8 December 1941, they struck first near the city of Prachuap Khiri Khan. After resisting the Japanese in the Battle of Prachuap Khiri Khan, after several hours the defenders were ordered to cease fire by the government in Bangkok. The provincial seal shows the Kuha Karuhas Pavilion, which was built when King Chulalongkorn (Rama V) visited the Praya Nakorn Cave (Amphoe Sam Roi Yot). Depicted behind the pavilion is the island of Ko Lak in Prachuap Bay, the historic center of administration. The provincial tree as well as the provincial flower is the rayan or manilkara (Manilkara hexandra). The provincial slogan is "City of pure gold, delectable coconuts and pineapples, delightful beaches, mountain and caves, land of spiritual beauty". The province is divided into eight districts (amphoe). The districts are further subdivided into 48 communes or sub-districts (tambon) and 388 villages (muban). There is an airport in Hua Hin district, but it is only for private chartered flights. The railway in Prachuap Khiri Khan is on the southern route from Bangkok. There are five major stations in Prachuap Khiri Khan: Hua Hin, Pran Buri, Muang, Bang Saphan Yai, and Bang Saphan Noi. Prachuap is on Thailand Route 4 (Phetkasem Road), which links the central region with the south. Thailand's royal family and especially former kings were the first to set this location on the map as the original seashore destination in Thailand. The long white sandy beaches themselves are clean and pretty, much more so than Pattaya's, and the sea is relatively clean. Besides sunbathing snorkeling and swimming, visitors can also enjoy golf, spas, caves, peaks, waterfalls, shops, seafood and nearby national parks. Ao Manao (อ่าวมะนาว) Ao Manao was once a battlefield in World War II between the Thai and Japanese armies. It is a clean beach suitable for swimming. Opposite the beach stands Khao Lom Muak. At ebb tide, a long sand bar will appear. At the summit of Khao Lom Muak, there is a replica of the Buddha’s footprint. Moreover, at the foot of the mountain stands a shrine of Chaopho Khao Lom Muak. Hat Wanakon National Park (อุทยานแห่งชาติหาดวนกร) It is a mixed deciduous forest generally comprising sparse woods and various shed-leaf plants mixed together such as Phai Pa and Bambusa bambos Originally, this area was a planted forest, mixed with a natural-grown one, which was just recovered. Fish found are fresh-water fish such as catfish, snake-headed fish, climbing perch, Nile tilapia, and various kinds of sea fish. The beach is 7 kilometres long, lined with Horsetail trees. Khao Chong Krachok (เขาช่องกระจก) is a small mountain where a large number of stump-tailed macaques reside. Its entrance is behind the City Hall with 396 steps to the summit, being a height of 245 metres from sea level. It is the location of Wat Khao Chong Krachok where a replica of the Buddha’s footprint and the relics of the Buddha, which the King came to attend its containing ceremony on June 12, 1958, and planted a Bodhi tree, are enshrined. 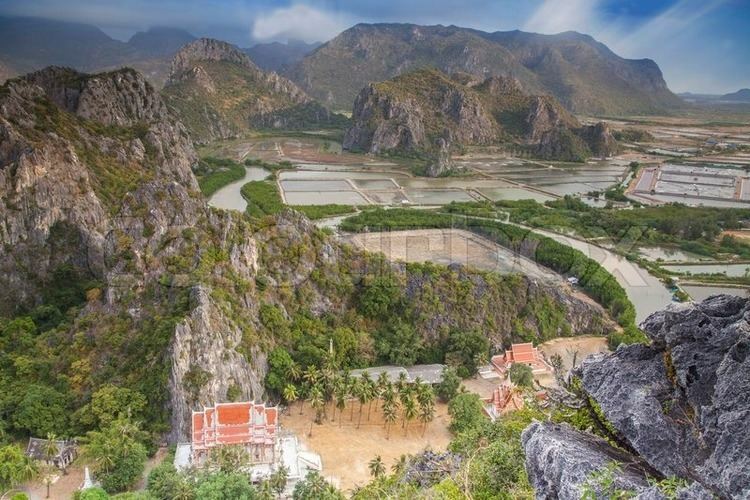 Khao Sam Roi Yot National Park (อุทยานแห่งชาติเขาสามร้อยยอด) It comprises high and steep limestone mountains by the beach and a wet mud plain beach combining with shallow sea, as well as limestone islets lined up near the shore, where various kinds of birds reside during November and February. It was named a national park on June 28, 1966, the fourth national park of the country and the first marine national park of Thailand. There are many attractions within the park which include Khao Daeng View Point, Tham Sai, Thung Sam Rot and Hat Laem Sala. Ko Thalu, Ko Sang, Ko Sing (เกาะทะลุ เกาะสังข์ เกาะสิงห์) are small islands located close to one another. Geographically, it comprises beaches, mountains and coconut groves with abundant white sandy beaches such as Ao Muk (อ่าวมุก), surrounded by a scenic atmosphere, white sand and a nicely coloured sea and corals. Namtok Huai Yang (น้ำตกห้วยยาง) is a small 9-tiered waterfall near the office of the Huai Yang National Park. It is popular for those wanting to relax due to its scenery and interesting nature study route. Pran Buri Forest Park (วนอุทยานปราณบุรี) Pran Buri Forest Park possesses a white sandy beach that is shady with a 1-kilometre line of pine trees on the east of the park. Moreover, from the park, the scenery of the sea, are the islands of Ko Singto, Khao Takiap and Khao Tao. This forest originally began as a royal project under the patronage of Queen Sirikit. Rajabhakti Park In Hua Hin, larger than life statues of seven prominent Thai kings. Cruising along the Pran River (ล่องเรือแม่น้ำปราณ) The Pran River originates from the Kaeng Krachan forest, passing mountains in the west before flowing into the sea at the mouth of the Pran River. Long-tail boats ply past important local attractions such as the City Pillar Shrine and Chaomae Thapthim Shrine. Home Stay (โฮมสเตย์) Ban Fang Tha Wildlife Preservation Village (หมู่บ้านอนุรักษ์พันธุ์สัตว์ป่าบ้านฝั่งท่า) It is a village with agro-tourism activities. Long-tailed boats float along the Pran Buri River passing mangrove forest, protected birds and water animals. Other attractions are Aromatic Coconuts - Maphrao Namhom, pineapples, pomelos, sapodillas, mangoes, and bananas. It can be considered a mixed cultivation garden. Diving Diving in Prachuap Khiri Khan may not be the kingdom’s best but there is still opportunity to experience exotic coral and marine life. Bangsapan, in the southern part of Prachuap Khiri Khan, is home to a couple of islands for decent snorkeling and diving. Ko Thalu By far, Ko Talu is the most appealing area in the vicinity for diving. The island offers divers shallow fringing reef and coral gardens with large schools of snappers, fusiliers and the occasional large ray. Besides Ko Thalu, there is also Ko Sang and Ko Lamla. Trekking The forest around Pa La-U Waterfall is the well known place for trekking. There are various species of birds and butterflies and some species of wild animals in the area.